This year a popular brand is introducing some new categories in their film awards and I thought I might help them with the finalists. Best lead Actor in a static role: John Abraham for Dishoom- He manages to keep the same expression throughout the movie, a feat which not even accomplished actors like Naseer have been able to do. For this, he has even managed to get a lifetime award nomination competing strongly with Sunil Shetty. Moreover, his abs have started acting better though a similar feat was attempted by his bare bottom earlier. The director had to give him a cigarette throughout the movie to ensure that he didn’t give any unwanted expressions either. 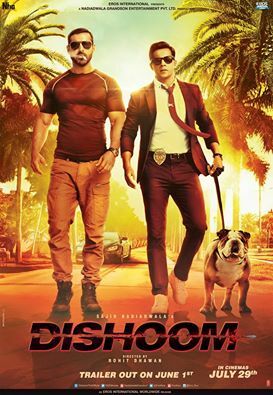 Best lead Actor in a confused role: Varun Dhawan in Dishoom- He starts as a supporting actor, continues as a comedian and ends up as the lead actor. Baba Ramdev might choose him as a brand ambassador for Patanjali toothpaste after his sheepish grins in the most unwanted situations have started gaining popularity. He was worried that he might be called a good actor after ‘Badlapur’ and hence chose this movie. Best Actress in a non-acting role: Jacqueline Fernandez in Dishoom- She was a natural fit after acting in Housefull since she had already practiced her expressions and didn’t need any workshop. Best Supporting Actress in a non-acting role: Nargis Fakhri for Dishoom: She is well supported by her bikini, thereby letting her assets speak for themselves. Best Villain returning after a long time: Akshaye Khanna for Dishoom: The hiatus from cinema seemed to have done him some good. He has a few more hairs on his head, looks better but still can’t mouth dialogues effectively. Best Actor in a non-supporting role: Saqib Saleem in Dishoom- The whole movie happens because he is kidnapped and you rarely see him in the movie. Best Cameos: Akshay Kumar in a gay avtaar with one of his best performances and Parineeta Chopra in her hottest appearance till date! Rohit Dhawan for Dishoom: Like his father, Rohit has a knack for making money from nothing. While David had Govinda to support him, Rohit draws it from his family and younger bro. A prolific cricketer – styled and named after Virat Kohli- is kidnapped by the don of the betting syndicate and Kabir (John) and Junaid (Varun) are sent to rescue him. The VFX in the movies is abysmally bad. You can make out the stadium is shot in croma. The art direction exposes that the caves are made from cardboard. Music from Preetam is passe. Enjoy your week in the rains! And if popcorn is what you love, buy it from your grocery store!! Note-IndieYogi’s posts are short/quick reviews, catering to the reader on the go. The attempt is to try something new in addition to the regular style of writing/reviewing.